the long-awaited exhibition ‘talk to me: design and the communication between people and objects’ has opened at MoMA in new york. organized by the design department’s senior curator paola antonelli and curatorial assistant kate carmody, the exhibit features a range of works interpreting humans’ interactions with machines, from diagrams and interfaces to products and furniture. 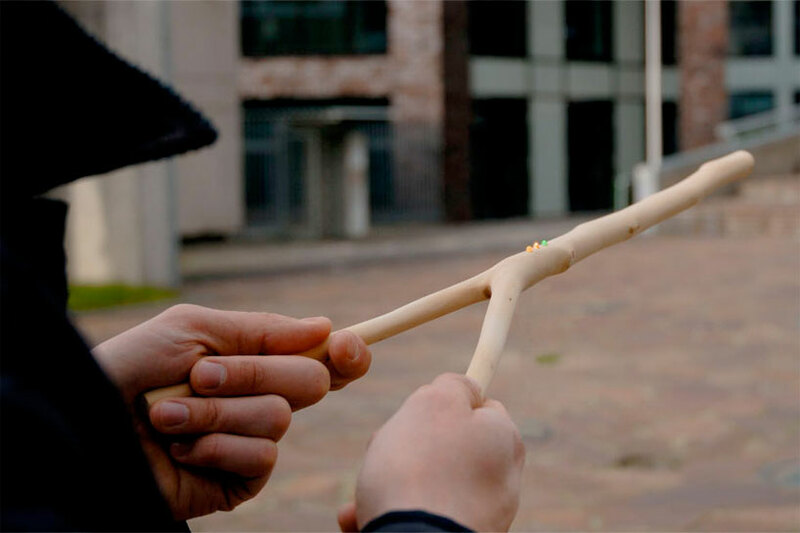 ‘wifi dowsing rod’ by eindhoven-based designer mike thompson adapts the familiar form of a divining rod– believed to hold mythical powers of locating underground water sources–to a contemporary function: thompson has created a tool which finds and indicates strength of nearby wireless signals. german designer konstantin datz has reimagined the rubik’s cube game for people who cannot see the toy’s original colors. white panels embossed with braille words for each color are adhered to the square surfaces, transforming the puzzle from a visual into a tactile one. ‘botanicalls’is a system that allows thirsty plants to reach out for human help, created by an ongoing collaboration between rob faludi, kate hartman, and kati london. moisture sensors allow the plant to trigger and send messages such as ‘water me please’ to its human caretaker over a wireless network, either via tweet or telephone with a human voice recording. the plants send both distress calls and notes of thanks. kacie kintzer’s ‘tweenbots’ are battery-operated cardboard robots that move constantly, depending on the kindness of strangers to get where they are going. marked by flags asking passersby to point them toward a particular destination, the robots consistently made it across new york city’s washington square park, helped by people when trapped by a bench, sidewalk, pothole, etc. kintzer’s secret surveillance showed that people would interact directly with the robots and were also willing to engage other strangers in a discussion of its predicament. norwegian scent expert sissel tolaas’s ‘berlin, city smell research’ examines scent as a tool to perceive space. applying headspace technology commonly used in the perfume industry, tolaas captures and synthesizes natural essences, ranging from the everyday (fresh laundry) to the less desirable (sweat, rotten fish) to create a catalog of scents that stimulate emotional responses and evoke memories. to render an olfactory map of the berlin, tolaas applied this distillation process to various districts: the resulting scents were then contained in bottles that physically recall the city’s geography, using smell as information to chart an urban landscape. israeli artist revital cohen explores modern reproductive technology with ‘artificial biological clock’: fed with information from the user’s doctor, therapist, and bank manager, the sculpture lets her know when is the right time to have a child, commenting on contemporary social pressures and expectations that dictate a woman’s childbearing ability. — a full list of the exhibition’s projects can be found here.